Analytics is the new material selection tool from Total Materia which allows critical material decisions to be made within seconds. 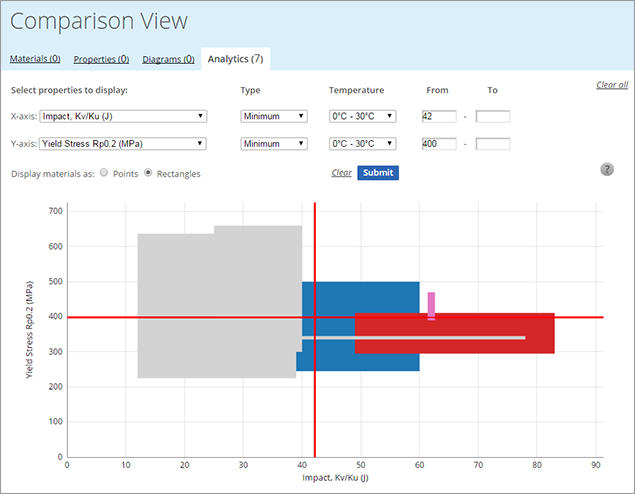 With analytics you can visually compare a list of predefined materials for the most important property parameters according to your application. Whether its finding the best candidates with two properties in mind or simply setting minimum limits for the most critical parameter to make immediate elimination, analytics can help! In this typical use case we are looking to see the relationship between impact and yield stress for a list of diversified materials to make sure our material is strong enough but on the other hand, is not too brittle. From any search or filter in Total Materia you can select individual or all materials and add them to analytics for further comparison. You can also add them from browsing sessions in our comprehensive cross reference tables. Once you are happy with your selections you can go directly to analytics by clicking on the analytics tool bar at the bottom of the page. As you can see it's possible to compare up to 100 materials in analytics at one time. The first job is to select the properties we want to compare, in this case Yield Stress vs Impact. 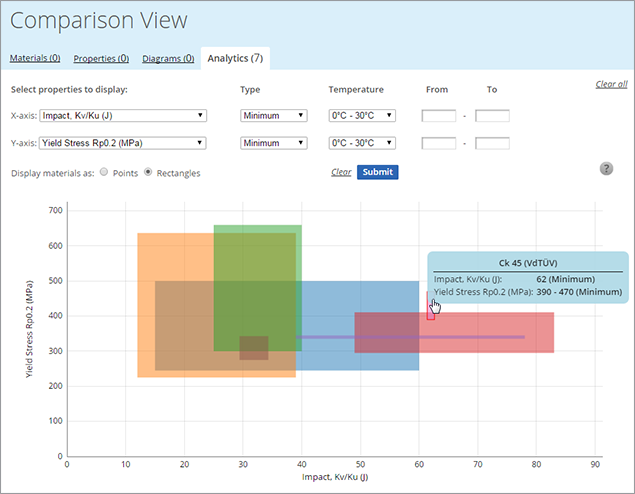 The default view is to see the materials displayed as points to give a quick visualization of the relationship of each material according to the material average values. 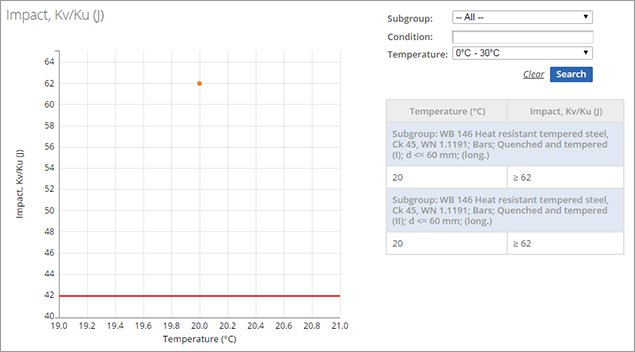 By clicking on the radio button to change the shapes to rectangles you can see the exact minimum and max ranges within each material covering all conditions. At this point you can also impose minimum tolerances according to your requirements. For example we may identify a minimum impact requirement of 42 Kv/Ku (J) and a minimum yield stress of 400 MPa. Any materials that fall completely outside of these parameters will become grey and therefore can be discounted at this stage. It is possible to then click into the details of each material and see the property details at the condition level, simply click on the rectangle which looks like the best fit. 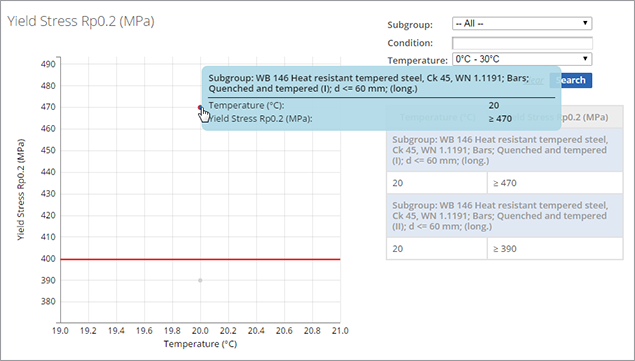 In this case we can see the points for all impact values for all conditions but the minimum tolerance red line is still in place to show that not all conditions for this material meet the defined requirements. 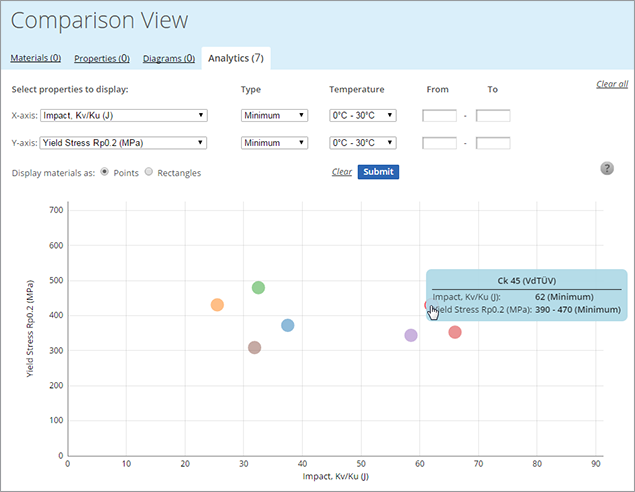 For impact we can see that the impact value available is easily in excess of our minimum and by hovering over the point we can see the specific subgroup and condition details. For yield stress we can see two options. One is a greyed out point at the bottom, under our red tolerance line and the other is the blue point which has an acceptable minimum yield stress of 470 MPa. By hovering over the point we can just make sure that the condition which is acceptable for yield stress matches the condition from the material for impact. 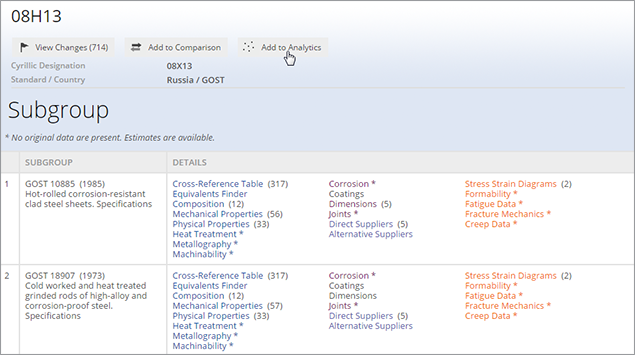 When analytics is combined with all of the other useful material search and discovery options in Total Materia it provides a truly powerful decision making tool for selecting materials based on real data!